he average adult has thirty-two teeth by age of eighteen; sixteen teeth on the top and sixteen teeth on the bottom jaw. Each tooth in the mouth has a specific name, location and function. The teeth in the front of the mouth (incisors, canine and bicuspid teeth) are ideal for grasping and biting food into smaller pieces. Back or molar teeth, are used to grind food up into a consistency suitable for swallowing. However, the average mouth has enough space for only 28 teeth to erupt and work properly. Thus, it is extremely difficult and painful for 32 teeth to fit in a mouth that holds only 28 teeth. These four excess teeth are the Third Molars, also known as wisdom teeth. Wisdom teeth are the last erupting teeth within the mouth. When they align properly, and surrounding gum tissue is healthy, wisdom teeth do not have to be removed. Unfortunately, this rarely happens. Wisdom teeth extraction is necessary when your wisdom teeth are prevented from properly erupting within the mouth. They may grow sideways, partially emerge from the gum, and even remain trapped beneath the gum and bone. 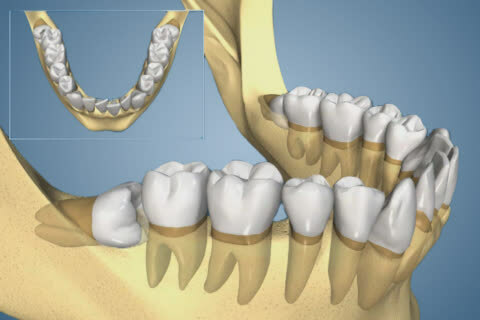 Impacted teeth may take various positions in the bone as they attempt to erupt successfully. Poorly positioned impacted teeth may induce numerous problems. When they are partially erupted, the opening around the tooth allows bacteria to grow and will eventually cause an infection (i.e. peristefanitis). This infection results in oedema (swelling), jaw stiffness, pain and fever. Besides, pressure exercised from the erupting wisdom tooth may move other teeth and disrupt the natural or orthodontic teeth alignment. The most serious problem occurs when cysts or tumors form around the impacted wisdom tooth, resulting in gradual destruction of the jaw bone and healthy teeth. Recent studies have shown that the potential risk of developing cysts or benign tumors around impacted teeth is 32% to 35%, while the incidence of problems with wisdom teeth during one's lifetime is in excess of 65%. Periodontal disease incidence also increases as the age passes by or impacted teeth and tooth decay coexist. Wisdom / impacted teeth removal, usually solves all prementioned problems. Especially if wisdom / impacted teeth removal occurs before the age of 25, reduces significantly possible implications of the surgery. Oral examination and x-rays of the mouth help us evaluate wisdom teeth position and predict if there may be future or present problems. Early evaluation and diagnosis during adolescence, result in a superior outcome for the patient. Patients are generally first evaluated by their dentist, orthodontist or oral & maxillofacial surgeon. This movie shows how wisdom teeth can put pressure on the arch and cause crowded teeth. This can occur even after orthodontic treatment. When should removal of wisdom teeth take place? Wisdom teeth removal may be performed under local anesthesia, laughing gas (nitrous oxide/oxygen analgesia) or general anesthesia. These types of surgery are provided by the oral and maxillofacial surgeon Dr. Senni and his experienced associates, in an environment of optimum safety utilizing modern monitoring equipment. Once the teeth are removed, the gum is sutured. To help control bleeding, bite down on the gauze placed in your mouth for thirty minutes. You will rest under our supervision in the office for fifteen minutes until you are ready to be taken home with no further complications.